Human growth hormone (hGH) is a protein that is produced and stored within the pituitary gland, a part of the brain. It goes into the blood in pulses, resulting in fluctuating blood levels. Levels may be affected by age, gender, sleep, physical activity, stress, fever, steroids and environmental factors. HGH stimulates many metabolic processes in cells and the production of other hormones, such as insulin-like growth factor and somatomedin-C. These hormones help with cartilage production, the release of lipids from fat tissue and increased production of cell proteins. The overall effects are increased bone growth, more lean body mass and organ growth. The Food and Drug Administration (FDA) has established guidelines for the proper use of hGH, used most commonly for hormonal deficiency that causes short stature in children. Off-label use has been abused by athletes and adults who hope to increase lean body mass and improve athletic performance. However, there has been no definitive evidence for improvements in strength or athletic performance. A recent review of all the available studies provided evidence suggesting that healthy young athletes only increased body weight and lean body mass while decreasing fat mass after using hGH. There were limited effects on performance outcomes in relation to endurance and strength. Furthermore, it was suggested that fluid retention accounted for a large proportion of the increase in lean body mass. There is a low risk for side effects in replacement doses that are close to the levels that the body naturally produces (0.003-0.004 mg/kg/day) for GH-deficient persons. The risk for adverse effects increases when higher than normal doses are prescribed, which include: increased pressure within the brain, elevated sugar levels, sugar in the urine, fluid retention, painful joints, painful muscles, breast enlargement in men and numbness/tingling in the extremities. Acromegaly (abnormal growth of the hands, face, and feet) is a serious side effect associated with large doses. Death from bone tumors and cardiovascular events have also been associated with high-dose use of hGH, correlating with a decreased life expectancy in users. Growth hormone is listed on the banned list of substances by the World Anti-Doping Agency and continues to be on the list as of recent updates for 2018. Testing is performed through blood samples. hGH use does not have an immediate effect, in contrast to stimulant drugs. Rather, to be effective, it requires the user to inject doses right under the skin regularly for an extended period of time. Athletic abuse doses probably will range from 15 to 180 micrograms/kilogram, 3-4 times per week, for 4-6 weeks in a cycle. Testing is thus performed typically weeks to months in advance of competition, or after unexpected sporting victories are achieved. Unless used under FDA-approved indications, the use of hGH should be avoided and discouraged. Prescriptions without a GHdeficiency diagnosis may constitute illegal prescribing. Madden CC et al. “Drugs and Doping in Athletes.” Netter’s Sports Medicine, Elsevier, 2018. 182-183. 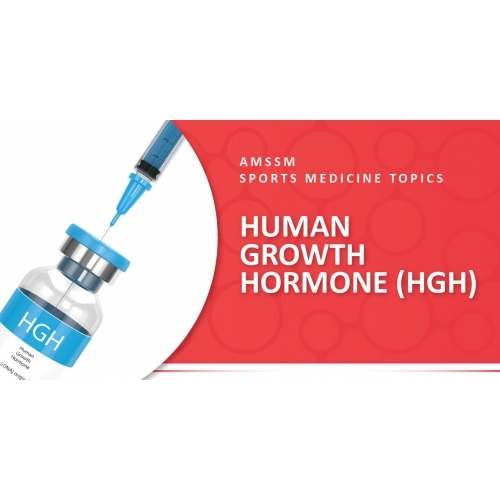 “Human Growth Hormone Testing.” https://www.wada-ama.org/en/questionsanswers/human-growth-hormone-hgh-testing. Accessed 11/30/2017. Hermansen K et al. Impact of GH administration on athletic performance in healthy young adults: a systematic review and meta-analysis. Growth Hormone & IGF Research. June 2017. 34:38-44.